Commence Day 1 of not-cooking-at-all for the entire holiday weekend. Which is good and bad. Good because it’s fun. It’s tasty. It requires no effort. Bad Less good (yeah, that’s some sophisticated grammar) because it can be expensive, and difficult to eat a balanced diet. 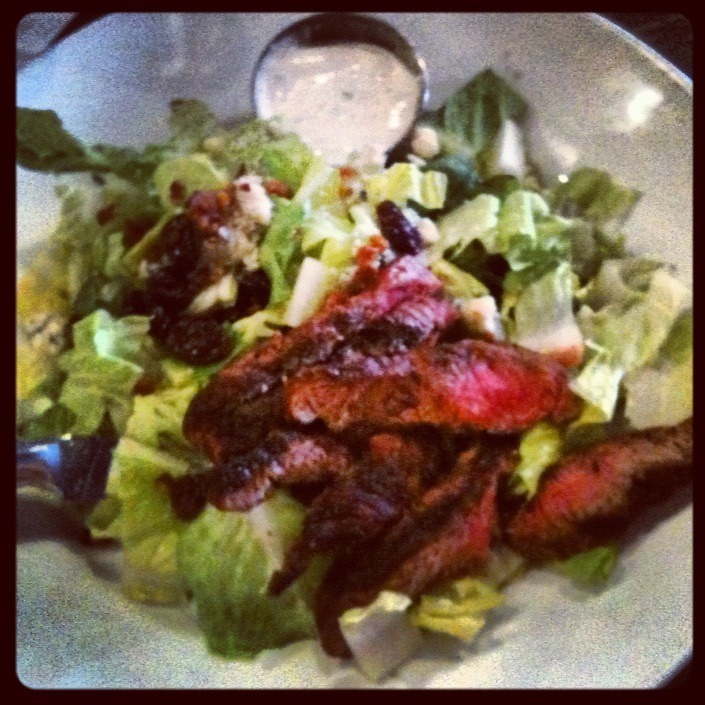 I actually have pictures of everything I ate today – that’s rare! 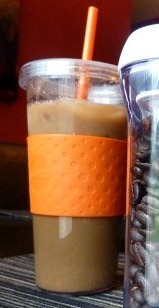 Breakfast was as usual, a 24 oz iced coffee from Espresso Royale. They have the BEST iced coffee of any place I have ever tried. This is what gets me out of bed in the morning. I Power Lunched (yeah right, who am I kidding) at Café Zola. This was only my second time here, ever. I went last year for my birthday brunch, as well. It was good, but didn’t blow my mind. The steak was good, but by the time I got my plate, the meat was kind of cold (probably because it was sitting on a bed of cold lettuce, not really anyone’s fault) – but it was appropriately cooked to my desired doneness (medium). The romaine was a little boring, but okay. The dressing was KILL-AH! (a.k.a.…awesome). As were the giant stilton crumbles. For dinner, the huz and I redeemed a Living Social deal at Jamaican Jerk Pit. Our deal came with fried plantains to start. These were tasty! 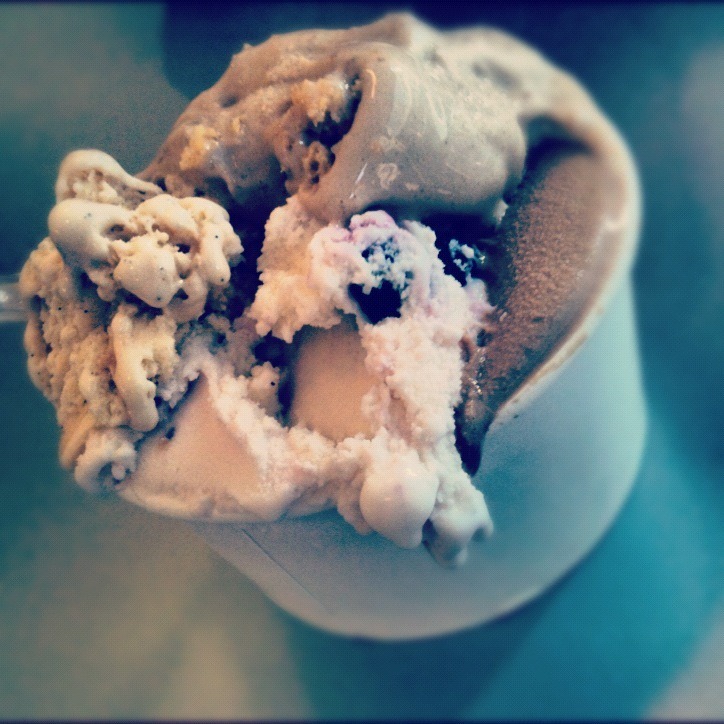 A crisp, savory exterior encased a soft, mildly sweet interior, which was enhanced by a dash of salt. 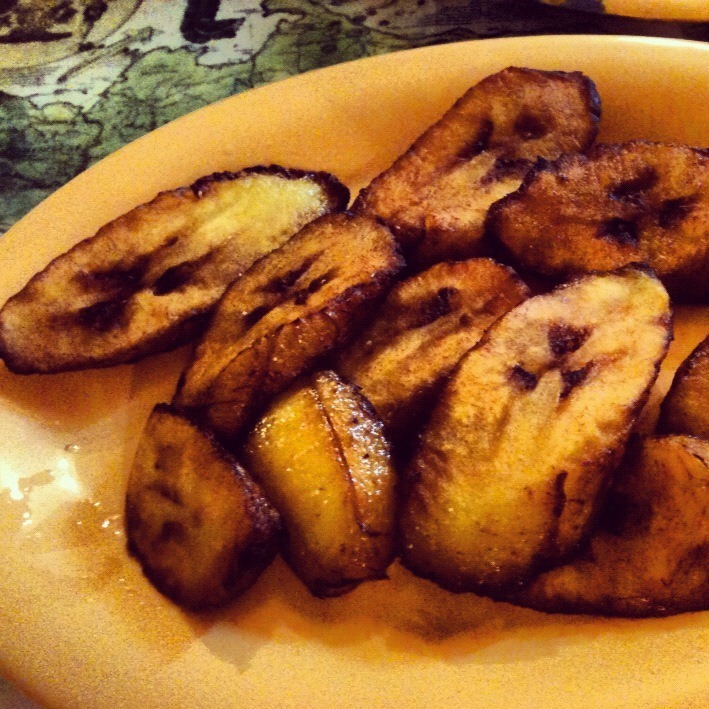 I also appreciated that these were not at all overly greasy, which can sometimes happen with fried plantains. (a-hemmm Frita Batidos, a-hem! [I love your food, FB, but you know it’s true!]). 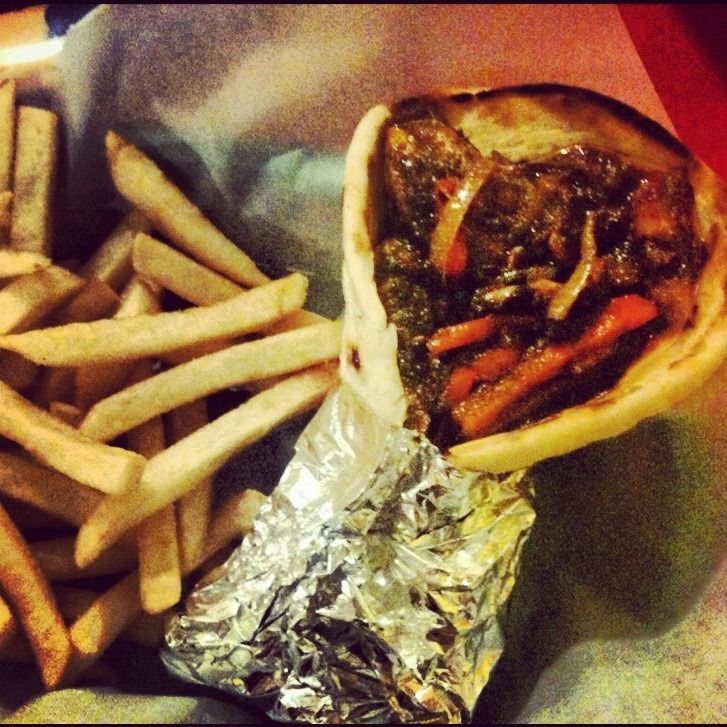 And for the main – our tried and true Jerk Pit favorite: the Jerk Chicken Wrap. Fantastic! The tender chicken was enhanced by a pleasing spicy heat, and was accompanied by a hearty serving of flavorful sautéed sweet onions and bell peppers. The pita bread is warm and pillow-y soft. By the time one reaches the last few bites, the bottom of the pita is a little soggy, but I actually look forward to those bites the most! Every time we go to the Jerk Pit we say we should visit more frequently because their food is tasty! Enjoy Memorial Weekend! I’ll be back with a recap after the weekend.